Myrtle, age 6 [born ca. 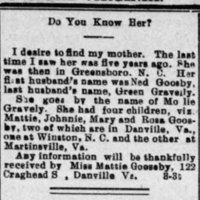 1895], is searching for her grandparents. 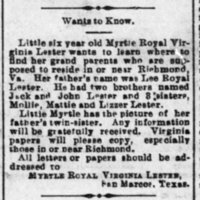 Her father's name was Lee Royal Lester. 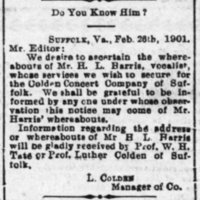 Colden, manager of the Colden Concert Company of Suffolk, Virginia, is searching for Mr. H.L. Harris, a vocalist. 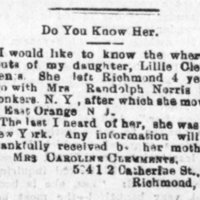 Lillie left Richmond, Virginia, for New York, four years ago [ca. 1897]. She last saw her mother in Greensboro, North Carolina, five years ago [ca. 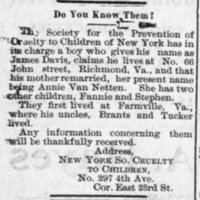 1896]. James Davis claims he lives in Richmond, Virginia. Son of Annie Van Netten. 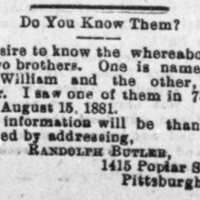 Butler, of Pittsburgh, PA, searching for Arthur William and Toler Butler, his brothers.